Launched by the light of the #MoodyMoon | #Florida | #Weee! | BattleOfOurTimes.Com ⚜ T.E.C.W. Launched by the light of the #MoodyMoon | #Florida | #Weee! Posted on March 23, 2016 | Comments Off on Launched by the light of the #MoodyMoon | #Florida | #Weee! The unmanned Atlas V rocket was launched by the light of the moon last night, heading for the International Space Station, carrying much-needed supplies. The rocket headed north with its precious cargo and paralleled the East Coast on its way to orbit. It was launched from Cape Canaveral Air Force Station in Florida. 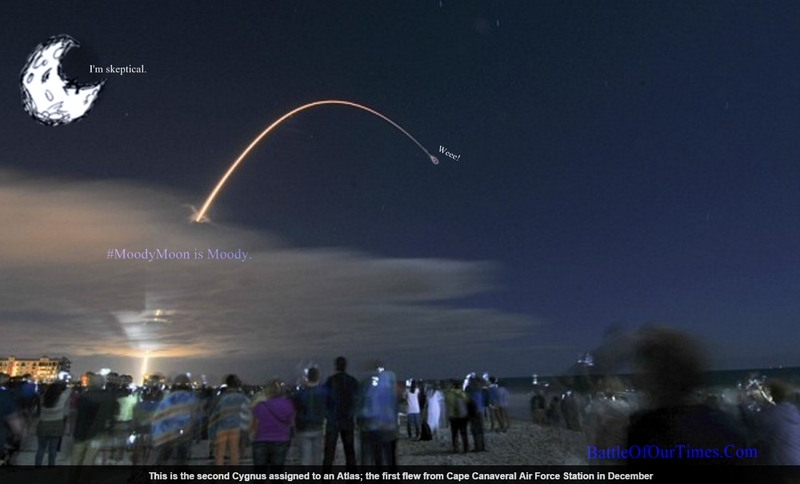 This entry was posted in #LWN and tagged #MoodyMoon, Antares Rocket, Atlas V rocket, Cape Canaveral, Cape Canaveral Air Force Base, Cape Canaveral Air Force Station, Cygnus, Florida, International Space Station, Moody Moon, NASA, Weee!. Bookmark the permalink.